Instagram is the star among the social networks. While the prophets of social media have been foreseeing the end of Twitter, Facebook and Snapchat for a long time, Instagram is being praised. But is all that praise really deserved? Can you really reach your fans on Instagram? You can. The number of users reached by a post on Instagram is surprisingly high. 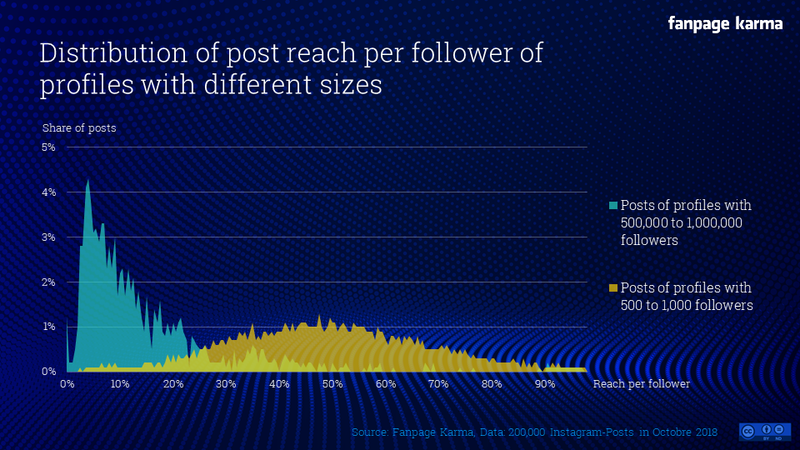 Especially small profiles reach more than half of their followers with a single post. For profiles with more than 500 but less than 1000 fans, it was was an average 48% of the followers. An enormous value. It should be noted that not all users that are reached must necessarily be followers of the profile. Through hashtags or the Discover section, the posts can also reach users who are not connected to the profile. Putting the reach in relation to the number of followers still makes sense, because only then profiles of different sizes can be compared. This becomes clear when comparing the reach of profiles of different sizes. As the number of followers increases, the reach per follower decreases. But there is no reason to complain. With a reach per follower of 10% to 20%, they are still well served. While this is less than what small profiles achieve, in absolute terms, 20% of 200,000 are still way more than 62% out of 500 followers. Reaching out to 40,000 of one’s 200,000 followers with a single post is hardly possible on Twitter or Facebook. The values ​​are only averages, of course. Even large profiles can achieve more and smaller profiles sometimes run out empty. However, looking at the distribution within the size groups, you notice something very interesting. For smaller profiles, the posts have a larger spread and are distributed symmetrically around the expected mean. Everything seems possible here: from 10% to 90%. The situation is different with larger profiles. In the example in the graphic you can clearly see that the posts of the larger profiles are much less scattered. A profile of the scale of 200,000 to 500,000 followers would find it very difficult to get more than 30% coverage per follower. Instagram Stories show the same symptoms of decreasing reach: The smaller profiles reach a larger share of their fans than the big ones. However, it is astounding that the reach of stories is a factor of 2 to 3 below that of posts. And that applies to all profile classes. That could have many reasons. For one thing, stories, unlike posts, have an expiration date of 24 hours. On the other hand, stories might not be as popular as commonly thought. Even if posts reach three times as many users, you should not jump to conclusions. Only in stories can companies set a link and lure the target group onto their own website. And even if it is less reach, it is still additional reach. A chance given on a few other networks. If you want to determine and compare your own reach, you can try it out on www.fanpagekarma.com.